Hanan Al Hroub- a teacher from a refugee camp in Palestine has been awarded prestigious one million dollar 2016 Global Teacher Prize, beating nine other finalists from around the world, including India’s Robin Chaurasiya, who runs "Kranti School" a not-for-profit school in Mumbai for girls from the city's red light district of Kamatipura. The top 10 finalists were invited on stage by a video message from physicist Stephen Hawking and were congratulated by video messages from US vice-president Joe Biden and former US president Bill Clinton. The award was announced in a video message from Pope Francis. Hanan Al Hroub was presented with the award at a ceremony held in Dubai for her outstanding contribution to the profession. The winner in 2015 was Nancie Atwell an American educator and the first recipient of the $1 million Global Teacher Prize. 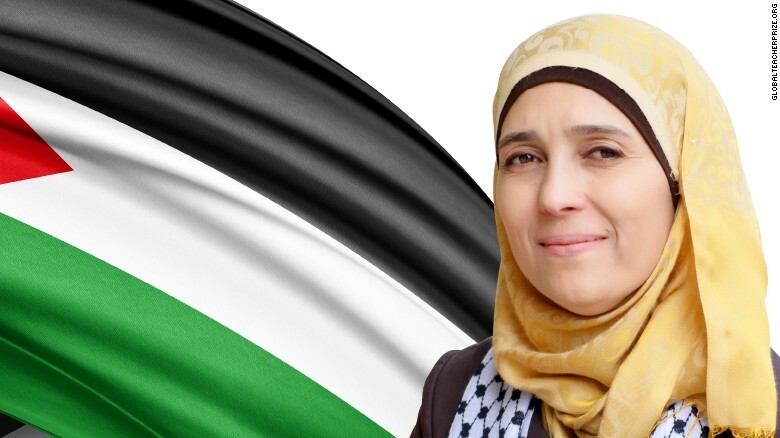 ♦ Hanan Al Hroub grew up in a Palestinian refugee camp and now is a teacher of refugees herself, runs the Samiha Khalil High School in Al-Bireh, Palestine. She works with refugee pupils, with an approach using play that is aimed at resolving violence and tension. ♦ She went into teaching after her children witnessed a shooting on their way home from school. The incident pushed her to think more about traumatized children and how classrooms can help. She developed a book called "We Play and Learn" focusing on the importance of playing, trust, respect, honesty and literacy. ♦ The Global Teacher Prize is presented by the Varkey Foundation. Its founder, Sunny Varkey, Kerala-born entrepreneur and educational philanthropist, established the for-profit GEMS Education company, which has more than 130 schools around the world. ♦ The award recognize one exceptional teacher who has made an outstanding contribution to the profession, employs innovative classroom practices and encourages others to join the teaching profession. Who has been appointed as the next Permanent Representative of India to the United Nations in February 2013 ?